Kids love to play games, whether it’s board games, video games, or making up games of their own. Paul Vasey, of Cash Crunch Games, joins me this week as we take a look at lessons we can learn about money from games like Monopoly or Pay Day. Paul explains that money is too often a taboo subject. But games provide a helpful way to start conversations about personal finance, without it being uncomfortable. Valuable lessons such as delayed gratification, budgeting & saving money, and managing a pay cheque, can all be found in several popular board games. In addition to well known titles, we discuss games that are specifically geared towards personal finance, including titles from Paul’s own company, Cash Crunch Games. We delve into other topics as well, such as whether or not giving kids an allowance is healthy, while Paul shares some money lessons that can be taught at the grocery store. It’s all here, in this week’s episode of The MapleMoney Show! Our sponsor this week, Borrowell, recently did a study which found a correlation between the frequency of checking your credit report, and an increase in your score. Borrowell will supply you with a free credit score, report and more, so you can see where you stand. Head over to Borrowell today to get your free credit score. Games create experiences that people will share. Money lessons that we can learn from board games. Games geared to personal finance. The pros and cons of giving kids an allowance. Can video games provide lessons on money? How to teach kids about money at the grocery store. Why is money such a taboo topic. Kids love to play games whether it is playing board games, video games or just making up games as part of playing throughout the day. 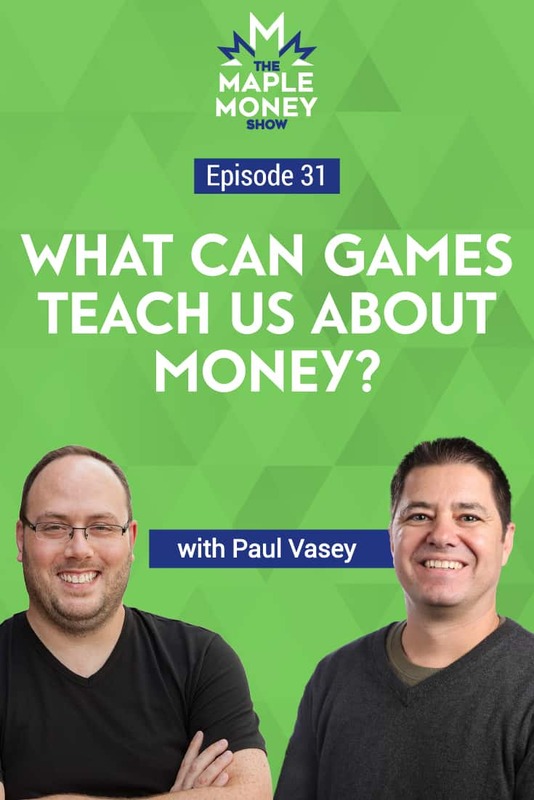 Paul Vasey is the founder of Cash Crunch Games so I asked him to join us to share what we learn when we play a game like Monopoly, Payday or even how our children can learn many lessons by making a game out of going to the grocery store. Tom: Hi Paul, welcome to Maple Money Show. Paul: Hey Tom. Good to be here. Thanks for inviting me on. Tom: You make a couple of games around personal finance and I wanted to go through how those games help people with their finances and the different levels within different age groups. Not just your game, but other games too. We’ll see what we can learn from games. My kids are always playing video games, games they’re not learning from. Paul: Well, you say that but actually, kids are playing fort-night and they’re learning about delayed gratification and learning about objectives and things like that. If you think about a game, go back a step before that. When you were learning to drive your car and you had lessons were you ever in the passenger seat talking to your dad or mom and say, “You should have your hands at ten and two and you didn’t do your mirror check or signal your maneuver. You’re breaking the rules. You’re going too fast.” Once you got some experience and you had some knowledge didn’t you ever tell your parents how to drive even though they’ve been driving for 20 years? Tom: Yeah, I probably did. Paul: Well, that’s what happens. As a schoolteacher I used to teach kids out of a textbook. You’d teach finance and they’d just glaze over. But, what I realized was when you make somebody an expert and give them an experience, they will talk about things. They will understand saying, “Hey, I actually get this. I can tell you… I’m an expert so listen to what I’ve got to say.” Gains, in a way, are fantastic for doing that because if you were talking about, let’s say, cash-flow, and you say, “Hey, here’s today’s pocket money or your allowance. How much are you going to spend? What are you going to do with it?” They’ll look at you and say, “I don’t know.” But if you actually said, “Hey, we played Monopoly last night. Remember when I had the hotel and you lost your money?” They say, “Oh, yeah, I remember that.” “So what are you going to do next time?” “Well, I’m going to get in there buy a hotel first because I lost my money and I’m going to get the money off you.” All of a sudden you’ve given them an experience which means they’ve now got something to think about and apply. They become an expert and you’re actually having a conversation. That allows you to direct the conversation to all the different areas. If we think about money, about cash-flow because it’s money in and out on a daily basis, you might have risk and reward with insurance and things like that. The denomination’s even counting up the money. How much money did you have? What was your net worth? All these things we talk about which kids have no idea what we’re saying, if you put it into context of something of what they’ve done, that’s how games bring those experiences out. And that makes that common sense and those concepts really, really easy. Tom: That’s a good point. Last week we had Matt Matheson (here in Canada) on the show and he was talking about teachable moments with kids. The idea that when something happens you can turn it into a teachable moment kind of reminds me of what you just said; you can play a game and just take its face value of entertainment or you can try to help the kids explain it. Something like Monopoly is probably the most famous game around money. One issue I find with it though is it almost encourages a massive rush of spending. Paul: Right. But then again, that’s strategy as well because you have that massive spend. If you’re not thinking about it properly and you’re just buying random properties, sometimes by overspending you haven’t got enough to pay your bills with because someone else has built houses and hotels and you are absolutely nailed because you have no money. Sometimes you have to buy. But if you spend too much and get some bills and you haven’t got anything to pay with, you start selling things at below price and all those kinds of things. So, there is a lot of that. I guess you’d be sort of picking your lessons with Monopoly. Tom: With a game like Monopoly, if you’re doing all that buying at first at least it’s with cash. You can’t actually start out with the mortgage. Paul: Right. You can actually borrow money against the bank. With the new game there is a credit card function in there. Tom: Yeah, I’ve seen that one. That makes it interesting. Paul: The new Monopoly is one is for Millennials. You don’t even buy properties, you buy experiences. That’s what I’ve read. Tom: That sounds very stereotypical Millennial. They don’t want somewhere to live, they just want experiences. Paul: There is always exploring so who needs somewhere to live, right? Tom: Exactly. Another game I like a lot is another huge one; The Game of Life. It gets a little bit more into education and careers and how those choices affect your outcome which also reminds me of the game you’ve got. Is it called, Cash Crunch Careers? Paul: Yes, it certainly is. Yes. Tom: Maybe you can go into how careers can be portrayed in games? Paul: Well, I’ve got a career platform where we match people to their traits and everything else but a lot of the time when you ask people what they want to do they say, “Well, I want to do this or that,” but one of the first questions they ask you is, “What does it pay?” Not whether they will enjoy the job—it’s literally, “What does it pay?” But if you flip that around and actually get the money habits sorted out to where you are living within your means you could almost pick whatever job or career you want, because you know you’ve got your spending under control. Now you’re more likely to find a career that you’re going to enjoy. So the Game of Life is good in terms of starting to figure out what things you need to pay and joining it with money and learning to live within your means. That’s the beauty of it. Tom: I like your idea of being able to get your money sorted out first so you can pick a career you like because nowadays everybody is bouncing from career to career anyway. Obviously, picking when you’re 18 years old, based on money alone, isn’t always the best choice. Paul: Well, you don’t know what you don’t know. I was just talking to my wife and told her I was watching a thing about linemen where they were up there fixing electricity. There are so many things you can do. Even in the armed forces, you could be painter or a vet, whatever you want. I just thought in the armed forces they were just digging trenches not being mechanics or electricians. The point is there’s so much we don’t know what we’re best suited for. But if we actually understand what’s out there, what’s going to match us and know we’ve got our money under control, it’s not going to stop you from going out there and choosing things you want to do. I think it’s very important that you figure that out. Tom: There’s a third game I want to bring up. And this is it for the mainstream games. One I really liked a lot and can see the lesson of is Payday. Do you know that one? Tom: I haven’t played it for awhile but the idea that you’re getting paid and paying bills is very budgeting based. Paul: Yeah. Ironically, with a calendar you get to see the inflow and outflow. And then you say, “Oh my giddy arch! Where has my money gone?” I know a lot of people say, “I just got paid but where’s my money gone?” And that’s the beauty of Payday. You actually see where your money’s gone over the month and that’s a big wakeup call for people. It’s true life. There are a lot of games out there that don’t give you a lot of reality but give you the lessons. But I also think sometimes you need to make it life-like. That way you can connect the dots and say, “Alright, yes. I’ve just swiped my credit card and I have to pay that money.” A lot of people don’t know that when you use your credit card, in essence, you’re borrowing money from a financial institution. And if you don’t pay back it back on time, you’re going to get loan shark rates of interest. But people don’t see that. So yeah, Payday is phenomenal like that. It’s been a very, very popular game since the 1960s or 1970s. Paul: He’s done wonderful stuff. Tom: Yeah, that’s a decent game for adults where they’re getting into more on investing and real estate. Paul: Right. Just like Monopoly and all the other games, once you’ve got the money it’s all about passive income. Cash-flow 101 is about getting out of the rat race. So you have your money and you’re able to invest, to look at passive income for returns on your investment. If you have enough return on the investments, you can give up your job and live happily ever after. But what it doesn’t take into account is getting the money because a lot of the time you need to get a deposit to buy that property. I think it was Jean Chatzky at FINCON said 78 percent of Americans live paycheck-to-paycheck. So how were they going to get that $20,000 deposit when there’s nothing left at the end of the month? That’s the area that’s missing. So you become the have-nots. They don’t become the haves until they learn how to get their money management sorted. Then Cash-Flow 101 is brilliant because it will teach you to think about investing and getting your money back. Just like Monopoly, buy your property and put houses or hotels on it and your get your money back. Tom: So it’s sort of, what can you do with that extra cash once you have it? Tom: I don’t know a lot about it but there was Cash-Flow for kids. Which also reminds me… you’ve got Cash Crunch Junior. Can you explain how that works? Paul: Yes, I just took what I thought kids needed to do in the classroom and what we need to turn the have-nots into haves. Cash Crunch Junior is a physical board game for ages 5 to 12 which basically teaches them the value of money. Saving first, and then looking at where the money is going when you spend it. That way at the end of the month there’s you can see the money and where you’ve spent it. You’ve got your cash and you’ve got your savings. We’re literally just teaching you to save first, spend later so that you have some money and you’re not living paycheck-to-paycheck. It’s like paying yourself first. That’s what David Burke said, didn’t he? Paul: I’m saying it too… You save first. You’re taking a bit out of that first, and whatever you have left you can spend. Meanwhile, you’ve got some money left over which accumulates to be able to let the have-nots become haves. By the end of the year you have money to do what you want with. That’s the premise of the Cash Crunch games. We teach you the value of money first so you can do all the other stuff later. Tom: Another game I should mention along with Cash Flow for kids and Cash Crunch Junior I thought looked interesting was, Thrive Time for Teens. I hadn’t heard of it before but it seems to be pretty highly rated as another board game option. Another one I found that looked for kids was, The Allowance Game—the idea of doing chores to earn money. I thought was good to teach kids how to earn their way. Paul: Look at the big picture. You’re a parent so you know the worst case is, if you’re forever giving them an allowance all they’ll do is ask to be paid whenever you ask them to do something. That’s the extreme. On the other hand, what they’re learning that time equals the value of money. If you want money you’ve got to work for it rather than just having your hand out for it. There has to be a happy medium. But I’m all for allowances. The fact is, if you want to earn more money you’ve got to go out and get it. It’s not just handouts. And the fact that once you have burned through that money you will learn the value of the money because it’s taking you so long to get it in the first place. So, when you spend it, it’s gone. I’m a big proponent of an allowance, especially if there’s chores. I used to have to cut the grass every week. That was my responsibility. And I’d occasionally wash cars and anything else my mom wanted me to do like run my sister around town in the car. And I valued that in the end because now you’re putting a value on work ethics, reliability, watching your money, learning the value of money. I think an allowance is a big, big thing. But on the other side of it you’ve got to think, if your mom asks you to do something and you say, “No, what’s it worth? Or, pay me first and I’ll go and do it,” then it’s gone too far and that’s a big problem. Tom: So are you more a fan of this idea of doing chores to get a “set allowance” and not a dollar for everything you do? Paul: Oh, absolutely. But if you want extra money then maybe you can ask your parents if there are any chores around the house you can do to earn more money? And there are always things to do. Even as an entrepreneur, that teaches you there’s always money and there’s always something out there to do and that you’re willing to think about how you can make more money, what needs doing and being prepared for new opportunities. I think that’s a big thing. Tom: That’s where I think I’m headed with my kids a based allowance for the expected chores. Speaking of games, something I was proud that they had done was, the two of them earned a bunch of money through chores and saved it up for a Wii-U at the time. I was proud they had done that but I felt like I did it a little backwards because every single chore was worth a dollar or two dollars. Paul: No picking and choosing? Tom: Well, not just that but there wasn’t a flat rate. I didn’t tell them this is what your allowance is going to be and you’re expected to do this stuff. It wasn’t that every single thing they do had a dollar value to it. Paul: The thing is, if you go one step further and realize that some things are more valuable than others. That way they’re learning what their time is worth. That’s a lesson in itself. When I teach this I see the light bulbs going off. You’re working somewhere earning $12 an hour. Take off your taxes and you’re left with $10 an hour. Now, you go into a store and you want to buy some shoes for $40. That’s easily worth four hours of your time. And you’re kids are thinking it’s half a day at school. Is half a day in school worth those sneakers? Some of them will say, no. But the point is they’re making that connection which is a big thing. Kudos to your boys for actually saving up to buy a Wii-U together. Now they will value it and look after it. So when one’s in a tantrum and is throwing things on the floor they’re not going to harm that because they bought it together. They’re going to look after it. When you put a value on it, that’s brilliant. Tom: This is starting to sound like last week’s episode too. The thing right now though, is I’m trying to figure out what’s right with them, but I’ll get there. Paul: Parenting 101. There are so many books out there but what goes on behind closed doors is what you do. You’ve got to choose your path and do what you think is right. There’s no right or wrong path, it’s what’s right for you and your family. Tom: True, true. Okay, let’s talk about video games. Personally, when I was looking into this before our episode I didn’t really see a lot that really struck me as being truly personal finance. I guess it’s about finding those teachable lessons. Because, other than something like a Sim City, there really isn’t a lot where you’re really learning about money and resources. I know you’ve got Cash Crunch 101. But beyond that, I wasn’t finding a whole lot. What are your thoughts about video games related to personal finance? Paul: There an old saying, “Why Bonnie and Clyde banks? Because that’s where the money is,” right? Think about it. Where are the kids? I know physical board games are coming back now and that’s a great way for families to sit around a table and play and engage. But if you want them to learn things quickly, you go where the kids are. And unfortunately, they’re on their phones or on a tablet or whatever. It does have its value. But again, I think a lot of the financial literacy is going to come from the parents and the teachers who are teaching the kids. If kids knew it was a money game straight off, they just wouldn’t play it. They’d think it was boring. They’d rather go off shoot people or race (on video games). But, if you actually bring ideas in while they’re playing those games. Let’s say they’re racing cars on a video game or the computer. The parent can ask them, “Why did you choose that car? It has great tires and handling and speed but why did you choose it?” And then you can actually bring money into the conversation saying, “If we had money to spend, what would you choose and why?” Then you could get into more conversation as to what car would be the best value for their budget. That’s the way you do it. You can be creative and think about it in a financial way. I’m not a big lover of video games. I don’t play them. I’d rather be outdoors. But I wanted to make a difference with personal finance with kids and they’re usually on the computer so that’s where I had to go (rather that fighting against the movement). We have physical board games and online games but I think it’s very important to put concepts in there that the kids need for the future. Tom: Yeah. Like you were saying, if you find those times where you can teach them something, you can probably do that on almost any game. Paul: You can make a game even when you’re in the grocery store. Say you’re buying 10 items; ask them what the sales tax is going to be. Or if you’re paying the lady in paper money, what’s the change going to be? The closest answer to the total wins. There are so many things you can do to make into a game. And kids buy into this and they remember that. Tom: I like the idea of making a game out of pretty much of anything. When we bring the kids to the grocery store they do help. They just physically help get the groceries or I’ll send them off for certain things, so I’ll see if I can work math games into that. Paul: Well, yeah. Let’s say the next time you buy ketchup or something, look at the unit price and see if it’s better to buy a big box or a little box. Or maybe you’ve only got $6 and you need all four of these items so go and find them for me. Or maybe buying brand name foods versus no-name foods. The brand name may be three times the price of the no-name one but is it as tasty as that? There are all these things you can actually have conversations about and they can make their own minds up. Here’s one… We’re making dinner tonight and we’ve got $12 for all four of us. That’s $3 each. What are we going to eat? It will give them a whole new perspective on the grocery bill. Tom: I like that. I always thought games were just board games and video games. But I think I could get more mileage out of this idea of creating games from things we do every single day. Paul: You’ve played “I Spy” in the car haven’t you? I spied with my little eye, that game. That was invented to stop kids from getting bored and looking around. Games are not just on boards and online. Games are everything that engages you. That’s the idea. Tom: Yeah, I think I’m going to have to try this out with my kids because something like “I Spy” hasn’t been holding up as well nowadays. It used to work great but they get distracted easily now, especially with video games and stuff. It’s hard to hold their attention on a car ride or on an airplane. Anything I can do to keep them entertained and hopefully teach them something is great. One of the things I mentioned in the past on this show is how I left the school system not very good with finances, so I really want to make sure I teach my kids how this really works instead of them doing the same thing I did—get into college and go in the hole with credit cards and spend your student loans and everything. Paul: Is that why you came up with Maple Money? That was one of your motivations? Tom: Yeah. It’s a big part of it. Hopefully, it’s stopping people from making the same mistakes I did. I went through school doing great at math but it doesn’t really help you when it comes to how to deal with things like credit and stuff. I know your Cash Crunch 101 does a lot of credit related stuff. It gets into credit cards and credit scores and stuff. Something like that would be so much more helpful. Or even just a proper school curriculum based on personal finance. Paul: That’s the crazy thing. We use money every single day but we’re not allowed to talk about it. It was always a taboo subject. How much do you earn? People say that’s probably one of the rudest questions you can ask. So, Tom, how much do you earn in a year? That’s one of the rudest questions you can ask somebody. It’s not, “So Tom, I know you earn money and you own half of Canada and you’re a mogul (laughs) but what do you spend your money on? Or how do you spend your money—which is another question. We deal with money every day but we don’t know how to manage it. That’s the thing. Tom: That’s like some real estate agents I knew. They earned a ton of money but they couldn’t pay their bills at the end of the month. And it all came down to how they were managing it. Even though they made way more money and I was making, they couldn’t pay their bills at the end of the month. Paul: Yes, it’s money management. And guess what… when you get a pay raise what do you do? You go from shopping at an Old Navy store to a Gap store to a Banana Republic. You keep going up and up and up. You go to the next stage, maybe buying an SUV—then an SUV with all the bells and whistles. Then you go to a more expensive brand. That’s all you do is step up rather than staying where you are, controlling your money so you have more of it to invest with. Which will make you more money in the long run that you can then do those things with. They tend to miss out on that step to reinvest in themselves to make more money. They just want to go straight there and leave that step out. Tom: And that’s because there’s no education around this. If people learn these ideas without knowing the concepts it’s just simply, “I have this money and I’m going to spend it.” Then you get that lifestyle inflation as you go. Tom: Before we run can you briefly run through everything that you have and where people can find you online? Paul: Sure. First of all, you can find us on cashcrunchgames.com. The reason I came up with Cash Crunch games is what is because of the credit crunch; one minute you have it and the next minute you don’t. You’ve been squeezed and now you have no money. At cashcrunchgames.com we have a board game for ages 5 to 12 which is a physical board game. You play 20 minutes, 30 minutes and it teaches the basics of money habits, safe first and spend later, cash-flow, budgeting—all those kinds of things. Then we have Cash Crunch 101 which is a new version coming out. It’s an online game that teaches between the ages of 13 to 21 the same principles; saving first, spending later and opportunity costs. We also have credit cards in there. It’s a bit like Payday where you’ve got a choice of using a credit card or a debit card. We have bite-sized lessons where there are lessons written in 30 two minute chunks, giving you reading material and activities. We have Cash Crunch Careers which basically helps you find the right career for you. That way, when you find that career, you’re going to excel quickly. What we’re trying to do is get your money habits sorted so that when you get into a career you can choose on without having to worry about money. So, that’s what I have. Thanks to Paul for the fun episode about money and games. You can find show notes for this episode at maplemoney.com/paulvasey or check out all the episodes at maplemoney.com/show. Thanks as always to you for downloading this episode. If you want to find out more about all the games we discussed and more, head on over to maplemoney.com/games and I’ll see you next week.